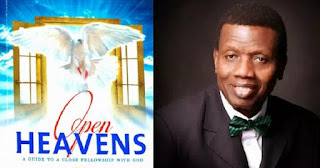 Open Heaven [30 May 2018] Mercy - Open Heavens Daily Devotional Messages, By Pastor E.A Adeboye. Mercy is an attitude of compassion, care and concern, grounded in love and sympathy towards others. It is God’s nature that is fundamental to His interaction with His Creator. As one of God’s attributes, mercy is also a key character He demands from His people. Our compassion towards others as Christians is usually activated by God’s compassion for people. Apostle Paul valued his conversion as a product of great mercy, so much so that he spoke about mercy more than any individual in the Bible. His messages, interactions with people and handing of situations were based on the backdrop of God’s mercy. God’s people who are beneficiaries of His great mercy are expected to be channels of divine mercy in the church and in the world.